In his August 2018 letter, Museum Director Mark Auslander reflects on the approximately 221 teal bows and ribbons on campus, tied around trees to honor the survivors of the horrific sexual abuse perpetrated by Larry Nasser. Recently, the parents and allies who placed the ribbons decided to remove them, to help protect the trees from a campus gypsy moth infestation. Museum staff have been assisting in this process, by storing and preserving the ribbons for posterity. For the past half year, all of us at the Museum, like so many at the University, have been deeply moved by the sight of approximately 221 teal-colored bows and ribbons, tied around the trunks of trees across campus. The ribbons were affixed in February and early March 2018 by the parents and friends of the survivors of the monstrous sexual abuse committed by Larry Nasser, a scandal that continues to leave deep wounds in the souls and psyches of so many individuals and families, as well as on campus and in the extended community. Teal has emerged as the color of the sexual abuse prevention movement, and many supporters of abuse survivors wear tiny teal ribbons as act of solidarity and protest. Never again. This will not stand. For the past six months, in effect, our beloved campus trees have carried on this tradition, standing guard as resolute keepers of memory. On each large bow of teal netting, the parents and allies affixed a small ribbon on which was written the name of one of the young survivors; in cases in which the survivor had chosen to remain anonymous, she was identified by the case number assigned to her in the recent trials. Most of the ribbons were wrapped around the trees of the campus arboretum, and some were placed on the hand rails of the library bridge. Each morning, walking to the Museum across the oval, the sacred space at the heart of campus, many of us were struck at a remarkable juxtaposition: in the shadow of unspeakable horror, we beheld fragile traces of great beauty and resilience. The ribbons endured winter blizzards and floods, and survived into the coming of spring and then of summer. Affixed to the trees that have witnessed so much university history, the ribbons offered powerful testimony, insisting that the suffering of those who had been so cruelly abused would not be forgotten, and that lessons learned from the scandal will, in time, reshape this institution. 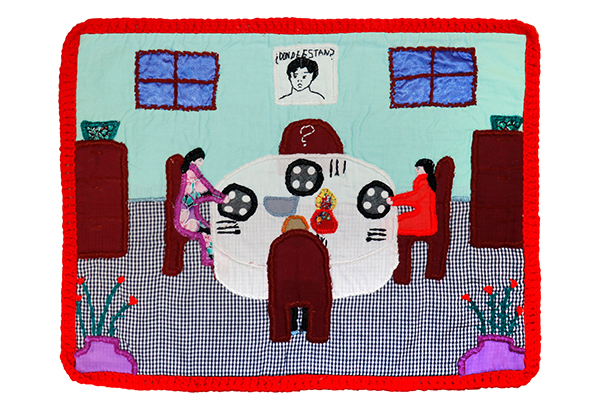 Since winter, the Museum staff and the University Public Art Committee have been thinking of how we might help document this remarkable integration of art, activism, and memorialization. We’ve talked to the student and alumni group #GoTEAL, which has committed itself to sexual abuse prevention and to #ReclaimMSU, which has struggled for a profound reconfiguration of the campus culture in the wake of the scandal. We had been hoping, in time, to preserve and accession banners, protest signs, and ribbons, safeguarding these articles for posterity. We had been thinking that someday these objects might become part of an exhibition co-curated by survivors, parents and allies. Naturally, we didn’t want to rush the process of collection, especially given how important the ribbons have become to so many, who have suffered so much. In late July, however, the timetable was unexpectedly accelerated. 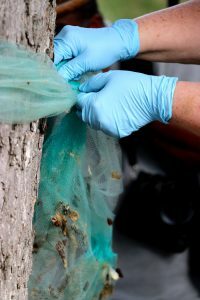 Gypsy Moths infested many trees across campus, and the netting of the ribbons proved a particular inviting site as female moths laid eggs and as caterpillars established their larvae. Since female moths tend to stay on the tree where they have emerged from metamorphosis, Dr. Frank Telewski, curator of the W.J. Beal Arboretum, realized that with the next cycle of moth reproduction, the leaves of hundreds of trees would be consumed, and many trees might die. 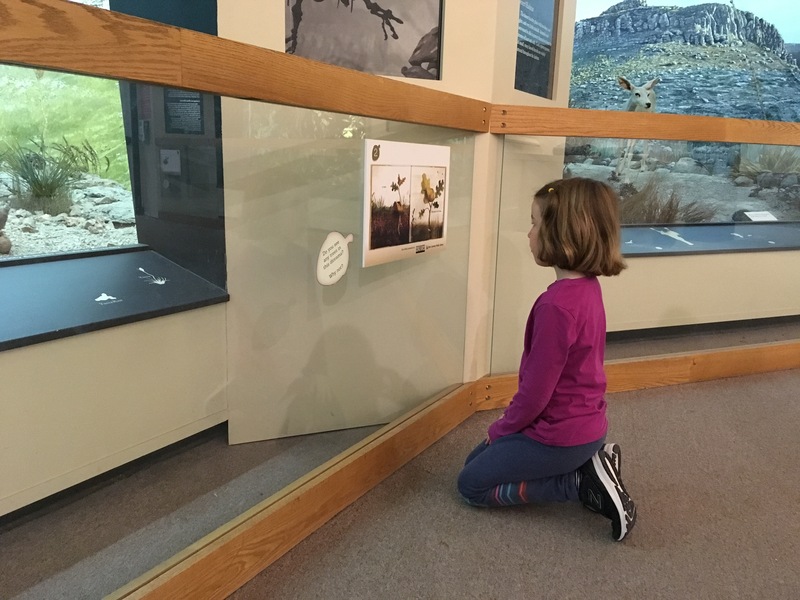 The Museum reached out to the parents to consult. Valerie von Frank, mother of survivor Grace French, explained that the parents are deeply committed to the health of the trees, which they all love, and had been careful to affix the ribbons without use of nails or tacks. After consultation among themselves, the parents agreed that the ribbons needed to come down expeditiously, but that they themselves, with the student allies who had originally tied the ribbons, needed to be the only people to do the act of untying. The Museum staff and Beal Arboretum staff immediately agreed to help. Museum curators and collection managers took responsibility for cleaning and preserving each ribbon, and the Arboretum staff marked each ribbon with a special aluminum tag, identifying each tree. (Since the W.J. Beal Arboretum is a scientific collection, each and every tree has a unique catalogue number). This detailed process is important to the parents, who want to make sure there is a record of the precise location of each tree where a survivor was honored. On a beautiful summer evening, we all met in front of the Museum. There, we gathered first in a great circle holding hands around a large oak, one of the first to have a ribbon tied around it during a February blizzard. We shared a moment of silence, and Valerie spoke to us of how the tightly tied ribbons are a monument to the strength and heroism of the survivors. She then untied the first ribbon, which was carefully placed in a bag by the Museum team. We moved first through the oval, counterclockwise around the Museum, as Valerie and Morgan, a student and friend of the family who had helped Valerie tie the ribbons on the first day, untied the ribbons. As they worked we noted the name of each young woman honored. We then moved to the trees on the great lawn in front of the Administration Building, Valerie explained that here she had tried to group together the dancers; it seemed to us that the lawn was a kind of expansive dance stage, honoring, amidst all the sorrow, the dancers’ exuberant joy in movement. We were moved to discover that on one of the trees right in front of the Administration Building dedicated to a survivor, someone had recently affixed a teal paper flower, just above the ribbon indicating the survivor’s name. We know that at commencement, graduate students carried paper flowers in solidarity with survivors, so perhaps one of the graduates decided to share her flower in this way. Once the ribbons are safely cleaned and preserved, we will begin the process at the Museum of exploring, with parents, survivors, students, and allies, how these objects, and so many other objects created in response to the horror, should be shared with the wider community. Our initial thought has been to offer our ground floor gallery as an experimental exhibition space, where these materials can be displayed, perhaps in early 2019, in a way that invites thoughtful contemplation and productive conversation. 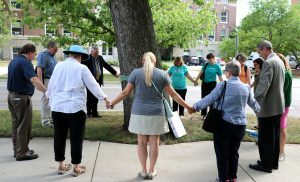 Perhaps, we have discussed with Valerie and Morgan, the Museum cell phone tour system might be used to share spoken commentaries by survivors and their loved ones, as supporters walking across campus to visit their trees. We are mindful of the need to practice what the memorial architect Julian Bonder terms an “ethics of deferral,” of being careful to stand back and not presume to speak for the suffering of others. Rather, our job at the Museum is to help create, with care, attention, and thought, spaces in which those who have been wronged can speak for themselves, in a great range of voices and media. This is especially important in the wake of these terrible crimes, which assaulted bodily integrity and which were compounded, inexcusably, by persons and systems that perpetuated regimes of silence and evasion. As an anthropologist who has long studied the symbolism of trees, in African and African American communities, I have been wondering why our campus trees proved such powerful repositories for the memorial ribbons. The remarkable life courses of these special plants would seem to be part of the story. Given that they often live so much longer than people, spanning multiple human generations, trees inspire reflection on the passage of time, on sorrow and endurance, on loss and joy, and on endings and new beginnings. 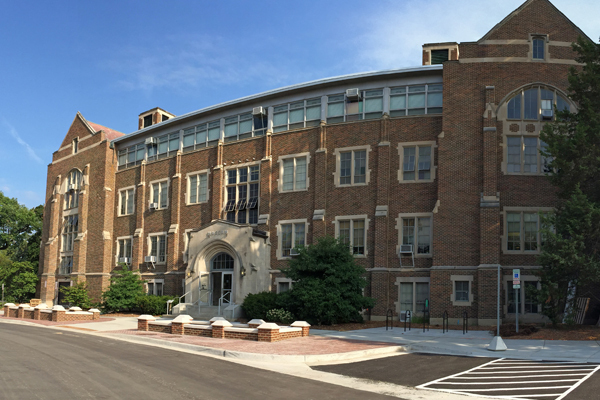 On the MSU campus, many of our trees date back prior to the establishment of the school and the era of colonization. They thus link us to the indigenous histories of the region, and to Native peoples who for millennia have understood trees as sacred medicine for body and soul. Many specimens in the arboretum bear witness to trial and tribulation, and exhibit visible scarring from disease and the elements. Yet, they have endured across the years. They have seen, in some instances, the passage of a thousand seasons. They reassure us that even in the winter of our discontent, the promise of new life and new energies still beckon. In some human cultures, trees can also remind us inconvenient truths. For the BaKongo people of central Africa, trees are understood as homes of the ancestors, who watch, often sternly, over the living. For this reason, masks and other sacred objects are properly made of wood, imbued with the essence of ancestral potency. In sacred ceremonies, the living lend their bodies to the masks, so that the spirits of the invisible world can instruct, and when necessary reproach, those of us living in the visible world. This will not stand. You will do better. Much better. Might something comparable be happening here? Are we too being reproached, with concern and love, by the more than two hundred trees that have worn the teal ribbons since the storms of winter? To be sure, ultimate questions of responsibility and accountability for the abuse scandal will be debated for many years to come. Yet, all of us know that we can, and must, do better. We are all called to hold up a difficult mirror to ourselves, as individuals and members of an institutional community, to ask how checks and balances failed those who were so vulnerable. We know we must unflinchingly face our failings. Each and every one of us must assume responsibility for preventing future atrocities. We are all our sisters’ keepers. My teacher, the anthropologist Marshall Sahlins, remarks that “a culture is a dynamic order of persons and things.” A culture is transformed, therefore, as relations between people and physical things are changed. I’d like to think that the dynamic relationships we are seeing, of people interacting with these material things, these fragile ribbons and these solid trees, is a key step in the remaking of our university culture. A group of individuals, in sorrow and in pain, braved winter storms to tie ribbons around trees, and then, in summer, gathered again, out of abiding care for the trees and for their human friends, to untie the ribbons. In so doing they released something that had been tightly bound up. In this cycle, of tying and untying, they present a gift to all of us, a model of positive collective action, of binding and unbinding, of concentrated attention and compassionate release. My sense is that all of us linked to MSU, as we wonder how to do right by the survivors, continue to carry within ourselves something still clenched, still bound up, still deeply troubled. The gift of the parents and allies, in tying and then unbinding those ribbons from the resilient trees, might just be the medicine we all need, as we struggle to remake ourselves and our University, rebuilding the beloved community right here at home and in the great world beyond.